Thirsty Pilgrim: The 'S' on His Chest Stands for Saison. One of my favorite places in town has revamped its beer list a bit. Nüetnigenough—hold on a second, do you need a pronouncer? I'm no authority on Brusseleer dialect (is anyone? ), but I seem to get away with saying it like this, really fast: noot-neeg-enough. Practice. Nüetnigenough's beer list shrunk from 28 to 25 but now contains no nonsense whatsoever. Light, bitter Taras Boulba and aromatic but sweet Lupulus are there now, plus a rotating beer of the month. In September it's the big and malty but nicely bitter Quintine Blonde from Ellezelloise. 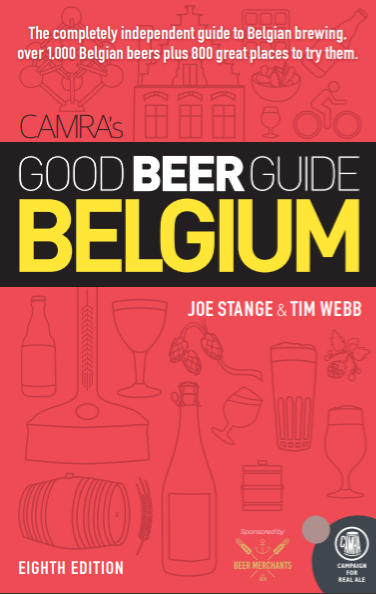 There's also a new one from West Flanders called Papegaei, a blonde of 8% strength. It's said to be from a new brewery in Diksmuide called Verstraete, but in fact it appears to be made at Deca Services—nothing to be ashamed of. The same kit has hosted the brewers from De Ranke (now in Dottignies) and Struise (getting ready to move a few miles away into schoolhouse-turned-brewery). Can't tell you what Papegaei tastes like. 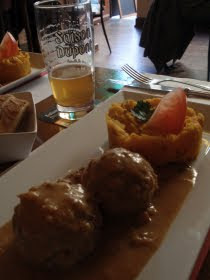 Not when there is Saison Dupont on draft, helping me tear through two large veal meatballs and carrot stoemp. I have no strength in the face of that beautiful kryptonite. Golden, quaffable, thirst-quenching, liquid kryptonite. Excellent food and damn fine beer. A nice stopping off point on the way to Soleil on a sunny Sunday afternoon.